Top Notch Material: Flat Iron Experts have all of your hair care essentials! Flat Iron Experts have all of your hair care essentials! I had almost given up on flat irons. I have wavy hair, but the follicles are very thin. Having hair like this is very hard to manage. You see…it does not look good in its “natural” state because it can appear frizzy, but if I apply too much heat then I get fly aways, and it just looks fried. I cannot use a lot of the oil based hair protectors because a tiny dab will make my hair look oily. So what’s a girl to do? Well, let me tell you MY solution. 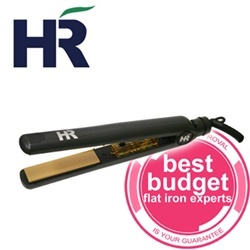 The H&R Professionals Flat Iron. This tourmaline flat iron keeps more moisture in your hair, eliminates frizz, and causes less damage. Using this in my hair really helps. My hair now appears less frizzy and much more stylish. It also makes my hair exceptionally soft..and not at all fried feeling! I cannot stop touching it, and just love this tool. Other flat irons have really done a number on my hair and damaged it very bad. With the H & R Professionals Flat Iron, I am not at all afraid of what is happening to my hair, the proof is in the hair! I know that my hair is still healthy..but now it is beautiful and much more manageable! I highly recommend Flat Iron Experts for any of your hair care needs. They offer just about every kind of hair accessory for any type of hair! Right now they have a fantastic deal going on…if you spend $100, you get three free items: mini-iron, shine spray and a heat pouch..a $70 value! Check it out today! disclaimer: I received my own flat iron for my consideration in this review. Yes, tourmaline flat irons are the best. The one that I’m using is Karmin G3 Salon Pro Hair Styling Iron http://www.sfrproducts.net/karmin-g3-pro.html . I have never faced any problem. It gives me lustrous hair every time I use it.